We're excited to announce that the London Metropolitan Police Service has selected TASER to outfit its officers with body cameras over the next three years. As part of the planned deployment, every uniformed officer will receive an Axon body-worn camera. The Axon platform is now the most widely used camera and digital evidence management system in law enforcement. For a year, the Metropolitan Police conducted a pilot program with 1,000 of our cameras—the world's largest trial of the body cameras to date. Led by the Mayor's Office of Policing and Crime, the trial was a success, and found that introducing the cameras resulted in a 33-percent reduction in complaints against officers. A new report released by the Mayor's Office of Policing and Crime and the College of Policing following the trial notes that the cameras helped collect evidence and resolve issues, and aided officers when challenged. It also states that over 90 percent of the public interviewed as part of the annual Public Attitude Survey said that the body cameras improve accountability, and 89 percent said they would prevent false allegations against officers. “I'm delighted that we will be able to press ahead with the roll-out of this technology. 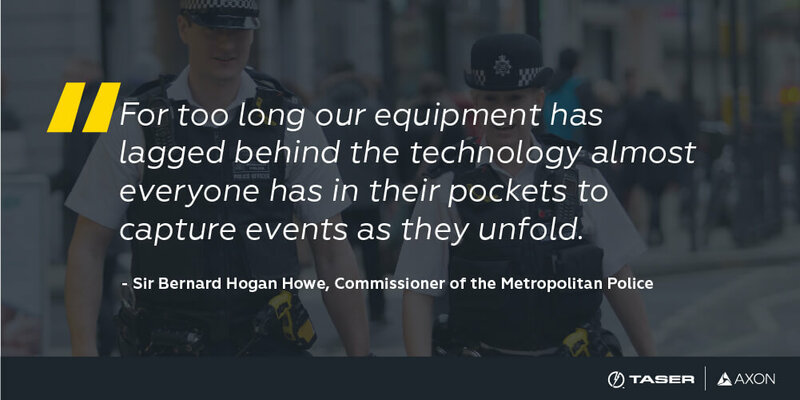 For too long our equipment has lagged behind the technology almost everyone has in their pockets to capture events as they unfold,” Sir Bernard Hogan Howe, Commissioner of the Metropolitan Police, said. “Soon, more of our officers will be able to make a record of the very challenging circumstances they are asked to deal with on a daily basis and then demonstrate, more effectively, the reality of policing our capital." The Metropolitan Police are at the forefront of innovative policing, and we look forward to working with them in the future as they protect truth and protect life with the latest in law enforcement technology. Learn more about the Axon Body 2, our newest body camera and what the Metropolitan Police will be deploying, here.